Most gyms are multi-purpose. So your gym floor has to hold up to a lot more than sports � dances, concerts, graduations and other activities. It gets heavy foot traffic,stains, scuffs, impact from furniture and more. 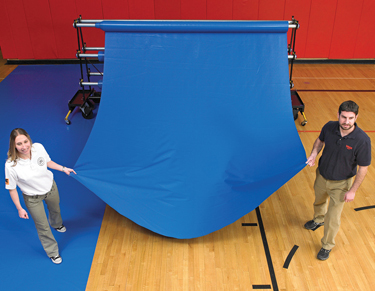 GymGuard� gym floor coverings are built tough to protect your investment. Whether you want to protect your floor over time or want to dress up your facility for the night, our gym? 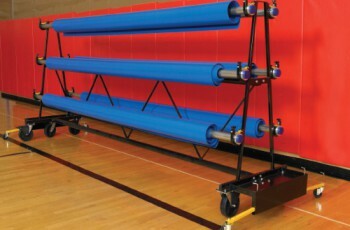 A gym floor cover is easy to roll out or roll up, especially with the use of our GymGuard� Gym Floor Cover Mobile Storage Racks. Get your quote today! Ultra durable and are coated on both sides with a PVC polyester mesh. Covers are rot, mildew and anti-fungal resistant. Cover would come in 10' wide sheets, 100' long. WARRANTIES depend on vinyl weight.